Spotify is reportedly considering an unconventional direct listing on a stock market that stops short of a full-blown initial public offering. It could see Spotify register shares on a stock exchange and become a publicly listed company without raising new cash, the Wall Street Journal reported. Shares would be traded on the day of listing, with the price based on supply and demand, rather than new investors buying shares the day before trading. A direct listing would save the music service the underwriting fees needed to launch an initial public offering (IPO), and would avoid diluting the value of existing stakes in the company. It could also sidestep a surge in first-day trading that often takes place after an IPO, which can signal that a company undervalued its newly issued shares. The tactic, though rare, is usually used by smaller companies that do not expect high levels of trading in their stock. A direct listing of a company is "basically just sticking it on eBay", says CMC Markets senior market analyst Michael Hewson. Whereas with an IPO new investors can buy shares from existing investors the day before trading begins, with a direct listing investors buy shares on the open market on the day they are listed for the going rate. How rare are direct listings? Very rare. "No-one does it," says Mr Hewson. Normally firms use an IPO as an opportunity to make lots of cash. In general, IPOs can also cost a fair chunk of money, and, crucially for Spotify, they can take a lot of time to set up. An IPO needs an investment bank or banks to underwrite an issue of new stock. Underwriting often amounts to the bank buying new stock to resell after the company floats. The bank also looks at the company as part of the process for setting a reasonable initial offer price for the shares. The underwriters "build a book" - that is, they go to institutional investors to gauge the appetite for the shares in the company that's going to be floated. Fund managers say how many shares they want and the price they would be willing to pay, and the level of this demand is one of the factors used to set the initial offer price. All of this to-ing and fro-ing eats up cash and time - and for Spotify, the clock is ticking. In March last year, the firm raised $1bn from investors at an interest rate of 5% a year, plus a discount of 20% on shares once they list. But under the terms of the agreement, the interest rate goes up by one percentage point and the discount by 2.5 percentage points every six months until the shares are listed. So as time ticks by, Spotify has to pay more to its creditors, and give them more of a discount on shares. As well as being a faster process, direct listing also means fewer regulatory hurdles, and it helps keeps expectations about share prices in check. 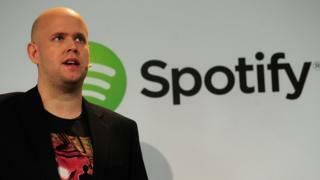 Spotify, which last year issued a $1bn (£801m) convertible bond, was publicly valued at $8.5bn (£6.8bn) in 2015. The Swedish firm was founded more than a decade ago and now has more than 50 million paying subscribers. This week it also signed a new long-term licensing deal with Universal Music Group, the world's largest record label. Spotify includes TPG and Goldman Sachs among its major investors.